Even before the U Ultra was available for purchase, HTC was already teasing a better phone, with a Snapdragon 835 processor. Now it looks like it might be coming on the heels of the Galaxy S8, and it could be one of the most interesting handsets of the year. According to a VentureBeat report, tipster extraordinaire Evan Blass dishes on next phone in the U line will bring the wild “Ocean” concept to reality. Following up on the video Blass leaked last year, the 5.5-inch, quad HD handset will reportedly feature a button-less design that relies on gestures to navigate and control things on screen. The original video, which relies heavily on Google Assistant, features a handset that utilizes touch-sensitive bezels to launch apps and navigate, letting the user squeeze and swipe the frame to do things like play music and control the camera. Blass says the phone won’t use the Ocean codename but will rather continue to push HTC’s 2017 U branding. The premier feature will be marketed under the Edge Sense moniker, according to Blass. 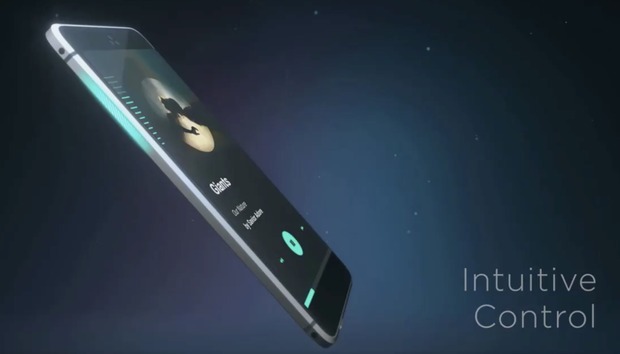 In addition to the funky frame, the new HTC U will also feature cameras similar to the U Ultra, though HTC will reportedly use a newer Sony version, “utilizing a 12-megapixel IMX362 around back and 16-megapixel IMX351 up front.” Blass says the new phone is due to be announced in April. A new U: While we certainly had our issues with the U Ultra, this rumor smacks of desperation on HTC’s part. One of our biggest complaints with the U Ultra was that it was too big, and from the looks of the video, the new U won’t be much smaller, especially if it requires wide bezels for its concept. A touch-sensitive frame might have been cool a couple years ago, but in the era of shrinking bezels, HTC’s new phone is going to stick out like a sore thumb. Not to mention, it will require users to learn a whole new way of holding and operating their phones—and how exactly are we supposed to put a case on it?